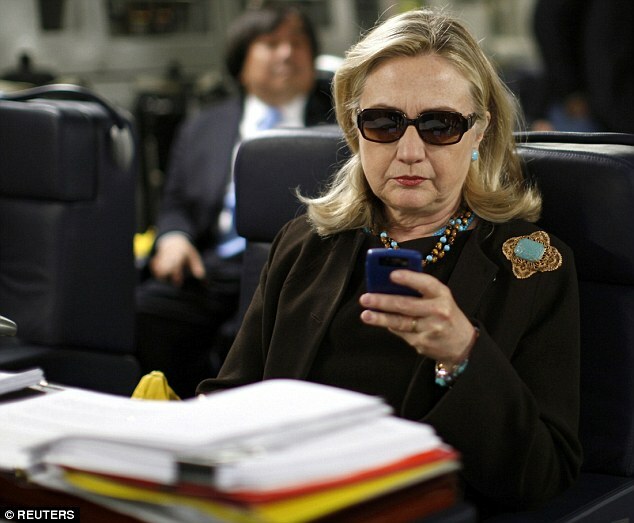 Hillary Clinton with the Blackberry the State Department did not give her. Hillary Clinton’s sole use of personal email to conduct official business as secretary of state has been the subject of oftentimes-intense debate on the campaign trail. Reports have paid particular attention to whether or not she mishandled classified information, speculation that has been buoyed by the retroactive classification of emails that she sent or received over her personal account. While Clinton, her camp, and the State Department’s FOIA office all share blame for her personal email use, the larger – and more complicated – problems of poor, outdated email management and government-wide overclassification have been buried by frenzied reporting on whether or not any of Clinton’s emails were classified. A very un-merry birthday to-do list. An August 3, 2009, email from Clinton’s unofficial adviser Sidney Blumenthal containing information “that might possibly be helpful” if US journalist Shane Bauer was charged as a spy after his arrest for inadvertently crossing an unmarked border between Iraq and Iran during a hike. Blumenthal notes, “He was not acting as a journalist at the time, though is a journalist—and a left wing kid”. The email was released in response to a FOIA lawsuit brought by Vice News’s Jason Leopold, and was notably not released to Bauer in response to his own FOIA request for records about how the State Department handled his imprisonment. A January 3, 2010, email confirms that she’s a fan of “Parks and Recreation” and “The Good Wife”, but has no idea how to work DVR. Other documents highlight her not-so-tech-savvy, her trouble with acronyms (ROLF! ), and her hatred of fax machines and her love of iced tea. 36 CFR 1263.22. Official as of October 2, 2009. Clinton insisted at the outset of the scandal that regulations requiring federal officials use a government email address, or at the very least routinely store emails from personal accounts concerning government work with the State Department, were not in effect while she was using her personal email address. Nate Jones and I debunked this claim last year, noting that the Federal Records Act, federal regulations on the books at the time (36 CFR 1263.22), and NARA guidance which the State Department received (NARA Bulletin 2011-03), should have prevented Clinton’s actions, requiring her to provide “effective controls over the creation and over the maintenance and use of records in the conduct of current business”. (Read here for our analysis of why Clinton, and hundreds of others at State, including its FOIA shop and IT department, were in the wrong for not blowing the whistle on her personal email usage.) Clinton recanted in September, apologizing for using personal email six months after the story broke, and repeated her call for all of the emails to be released to the public in full in response to FOIA lawsuits brought by the Associated Press, Judicial Watch, Jason Leopold, and dozens of others. As the State Department nears its deadline for releasing all of Hillary Clinton’s 30,000 work-related emails – a U.S. District Court, in response to Leopold’s lawsuit, ordered the department to release all the records by January 29, although the department is requesting an additional month –, one key take-away is that the government is failing – 23 years after a National Security Archive lawsuit established emails as government records – to preserve emails. 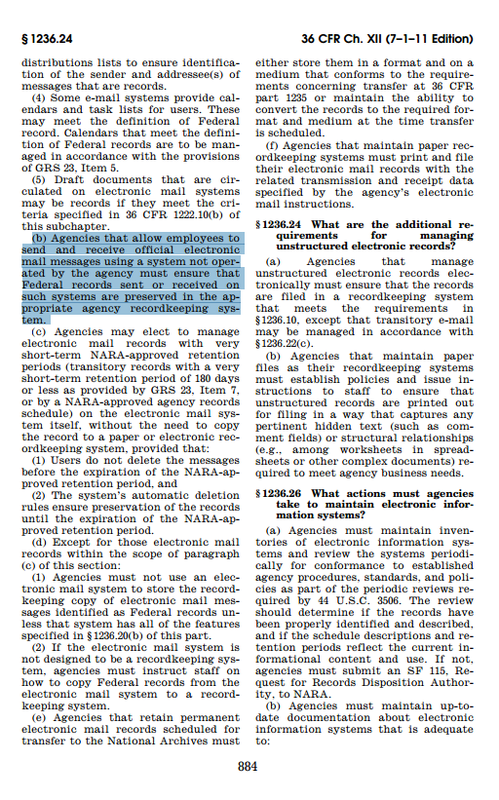 Current Office of Management and Budget guidance does not require federal agencies to manage “all email records in an electronic format” until the end of 2016, and the US National Archives currently trusts agencies to determine and preserve emails that agencies have “deemed appropriate for preservation” on their own, often by employing a “print and file” physical archiving process for digital records (only one percent of government email addresses are saved digitally by the National Archive’s recently-initiated “Capstone” program). The State Department, however, has a particularly bad email management system. A 2015 Department of State OIG report found State’s email archiving system, ironically named SMART, goes almost entirely unused. The report found that State Department “employees have not received adequate training or guidance on their responsibilities for using those systems to preserve ‘record emails.’” In 2011 State Department employees only created 61,156 record emails out of more than a billion emails sent. In other words, roughly .006% of DOS emails were captured electronically, meaning Clinton likely preserved her records better than had she exclusively used a state.gov account. A separate State Department Inspector General report, which was released earlier this January, shows that the agency’s FOIA office – perhaps especially under Clinton – compounded poor email management by giving an “inaccurate and incomplete” no-documents response to a FOIA request concerning Hillary Clinton’s email usage. 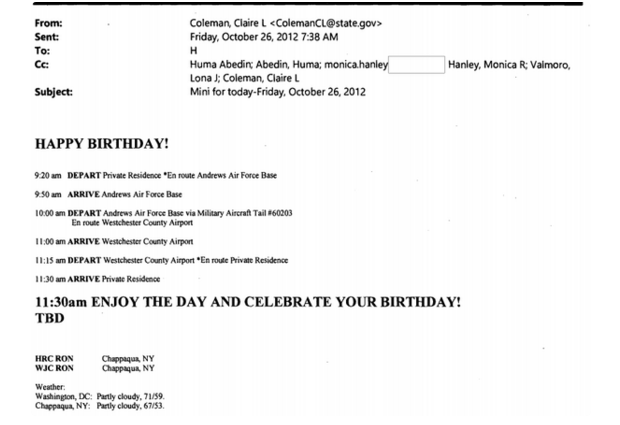 Troublingly, State’s FOIA office told Citizens for Responsibility and Ethics in Washington (CREW) in response to its 2012 FOIA request that it had no documents on the subject of their request, even though Cheryl Mills, Clinton’s Chief of Staff, knew both of Clinton’s personal email account and the FOIA request, and advised a close aide to keep an eye on it. The Wall Street Journal also reported that Mills “insisted on reviewing all Keystone-related documents being prepared for release, and flagged as problematic a few that the department’s records-law specialists felt obligated to release.” Mills reportedly informed a FOIA specialist that if records were released that Mills wanted withheld, “Mrs. Clinton’s office wouldn’t comply with any future document requests on any topic.” The Journal notes that the State Department was advised by a FOIA expert to shield Keystone pipeline documents by withholding them under the b(5) “withhold it because you want to” exemption. Despite the airtime Clinton’s email practice has received in the campaign to date, not a single presidential candidate has offered their solutions for fixing poor records management practices and a FOIA system that Rep. Jason Chaffetz (R-Utah) recently called “broken“, and not a single debate moderator has asked a question about how to fix them. Draft 2009 speech Clinton delivered to the CFR withheld entirely by discretionary b5. Yet that seems to be what the State Department and the Intelligence Community are doing. 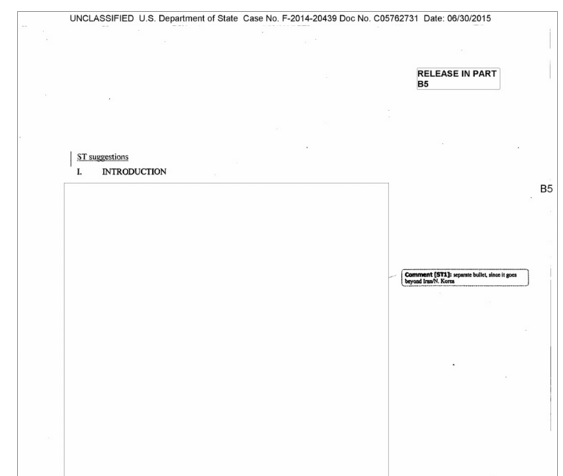 In a July 2015 release of 3,000 pages of Clinton’s emails, State redacted portions of two dozen emails – even going out of its way to fully redact a 16-page speech Clinton gave to the Council of Foreign Relations in 2009 again using the “withhold it because you want to” Exemption 5. The State Department hid this unclassified document in its entirety despite the incredibly high public interest in the records. 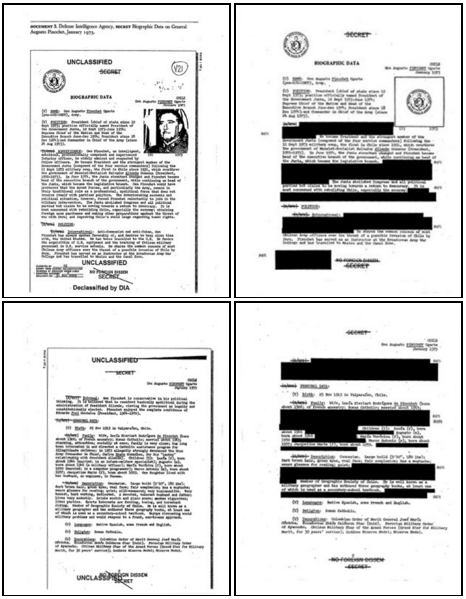 All of the redacted emails contained in the release are unclassified, and while “their contents were apparently not sensitive enough to national security at the time to have required a higher classification status” they must now, confoundingly, be redacted in part or in full. More recently, the Inspector General for the Intelligence Community reported that Clinton’s personal emails contained “several dozen” classified emails – including emails related to drone strikes that were at “special access programs” level (a step beyond Top Secret), at least according to the CIA. Politico reported that the information in the emails was “per se” classified, rather than obtained through a classified product, because it pertains to drones – even though President Obama acknowledged drone strikes against Pakistan and US drone strikes are regularly reported on in the news. It is a bizarre world where the killing of an estimated 2,500-4,000 people (according to the Bureau of Investigative Journalism) is such a secret that the Secretary of State cannot talk with her aides about it. This Catch-22, combined with the Intelligence Community’s insistence that “you could easily classify the ham sandwich” — a joke made by the former head of US classification policy, Jay Bosanko — will ensure that governing the Department of State without being allowed to freely speak about a cornerstone of US foreign policy (drone strikes) will remain a Kafkaesque impossibility. A “great” example of overclassification can be found in the DIA’s 1975 biographical sketch of General Augusto Pinochet, released in 1999 (L) and 2003 (R). The DIA blacked out large sections of the Sketch on ostensible national security grounds in the second release, including General Pinochet’s liquor choices – “scotch and pisco sours”. ISCAP continues to overwhelmingly overrule agency classification decisions. Blanton is far from alone in pointing out persistent overclassification. The latest Information Security Oversight Office report showed that the Interagency Security Classification Appeals Panel (ISCAP) continues to overrule agency classification decisions in Mandatory Declassification Review appeals nearly 75% of the time. 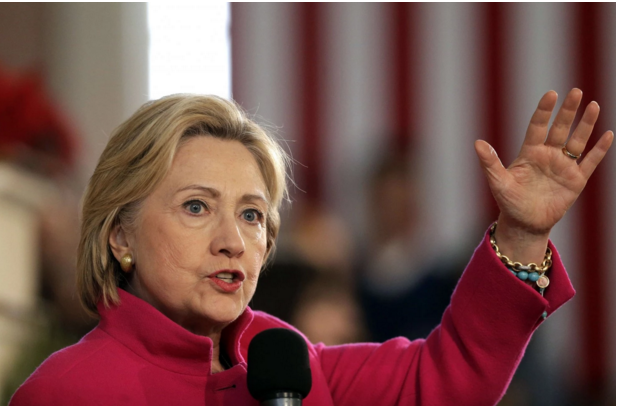 To her credit, Clinton has repeatedly insisted she wants the documents made available in their entirety to the public. Unfortunately, this hasn’t happened. At the time of writing this, more than 1,300 records have been retroactively classified. Thousands more have been unnecessarily withheld pursuant to the B5 exemption, supposedly discretionary and only intended for use when an identifiable harm outweighs the benefit of release. It is indefensible that finite FOIA resources have been wasted to withhold unclassified records that are the subject of enormous public interest even after President Obama and Attorney General Eric Holder mandated — six years ago — that agencies limit the use of this exemption except when absolutely necessary. Luckily, it may be possible that overclassifcation can be addressed, and indeed, reversed. The same ISOO report also showed that from 2010 to 2014 the number of new secrets created each year (“original classification decisions”) dropped, and that in 2014 the number of new secrets generated was the lowest on record. The government needs to redouble its efforts to reduce overclassification and update woefully outdated email preservation technology. If Hillary Clinton wants to prove her transparency and open government bona fides, she should add these important planks to her campaign platform. It is the next president who will determine if the remaining secret documents on the JFK case including the Oswald records will be released and the censored records of Saudi and other countries involvement in 9/11. I haven’t yet heard any candidate call for more openness and transparency about the public’s right to know what their government is really doing especially since most of the records seen by those with authority have been judged “shouldn’t have been classified” in the first place.